Our product range includes a wide range of nabl laboratory. Accreditation provides formal recognition to competent laboratories, thus providing a ready means for users to find reliable testing and calibration services in order to meet their requirements. Also, Accreditation enhances their confidence in accepting testing / calibration reports issued by accredited laboratories. 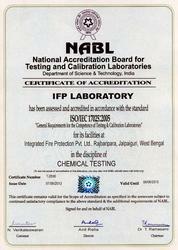 Certificate of Analysis issued by accredited laboratories is globally acceptable as NABL has established its Accreditation System in accordance with internationally adopted Standard i.e., ISO/IEC 17011:2004. Further, NABL is signatory to International Organizations – ILAC (International Laboratory Accreditation Cooperation) and APLAC (Asia Pacific Laboratory Accreditation Cooperation).